Jennifer Morris, Owner and Director of Blooms for J. Morris Flowers, 120 East Market Street. Ruby Red, Burgundy and burnt Orange strike a balance with blush pink and greens. This installation was a team effort under the direction of Jennifer, inspired by installations seen on the streets of London. Thank you, Leesburg community, for celebrating our grand opening with us. We were so glad to reunite with old friends and make new acquaintances. Preparations for this special day provided my team and I the opportunity to introduce permanent fixtures in our retail section, including our Succulent and Cut Flower bars, and to showcase some of the grander work that we do behind the scenes week after week. We created three floral installations (one outside and two inside) that were intended to stir your imagination, each one exposing you to new possibilities for floral decor. Our space is now fully renovated in shades of grey, the perfect canvas for the full range of colors available throughout the year in the flower kingdom. As I created my design board for our November 10 open house, I thought about the colors that had inspired me in 2017. I have always been drawn to bold color (see this Fall's Hemingway Collection) so I am really enjoying the growing trend toward strong color in both clothing and home decor. My final palette included a full complement of jewel tones: Ruby (red), Topaz (French blue), Sapphire (navy), Emerald (green), Burgundy, Amber (burnt orange) and a softer blush pink. We have done some amazing weddings this year partnering with more than 140 couples to create florals that capture beauty the way they see it. We are totally invested in engaging our clients in the creative process, whether for weddings, events or every day design. 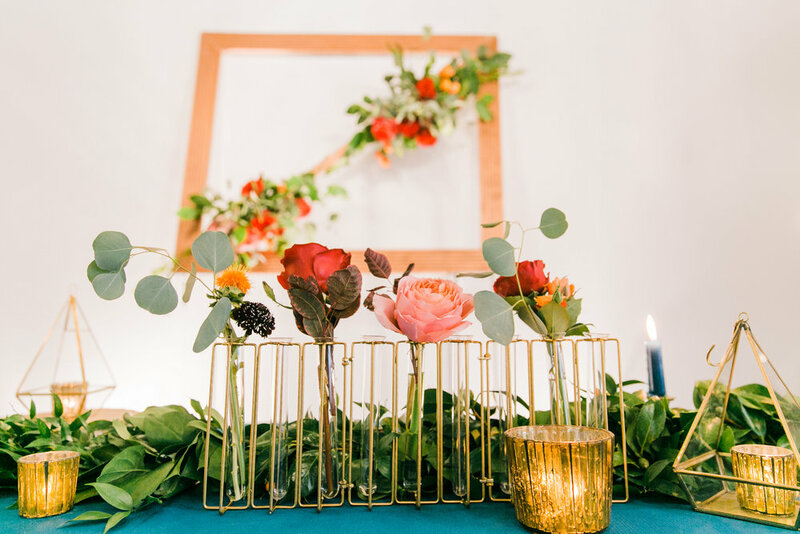 The table top hanging floral and living floral frame seen below have both been featured in weddings throughout 2017. We honestly believe that these types of installations can be incorporated into your parties or events. If you weren't able to come in, I hope you were driving by Market Street two weekends ago to see the floral installation that surrounded the doors and windows of our studio. We promise to repeat this kind of display again. Leesburg is a community of people that loves to celebrate and enjoy beautiful things and we are here to serve you. Stop by anytime, we would love to show you around and share some of the flowers and vases that we are currently working with. Our studio is an open concept floral design space where you are welcome to watch us as we work. You can schedule time to meet with you about your own ideas. Use the button below to reach out to a member of our staff. Newer PostWho should you bring to your wedding consultation?